••• Special Free Edition ••• Perfect for those traveling to Ukraine, this phrasebook is designed to do exactly what the name says - make speaking Ukrainian easy for you. Written specifically for English-speakers, this highly accurate Ukrainian phrasebook leaves no room for mispronunciation. 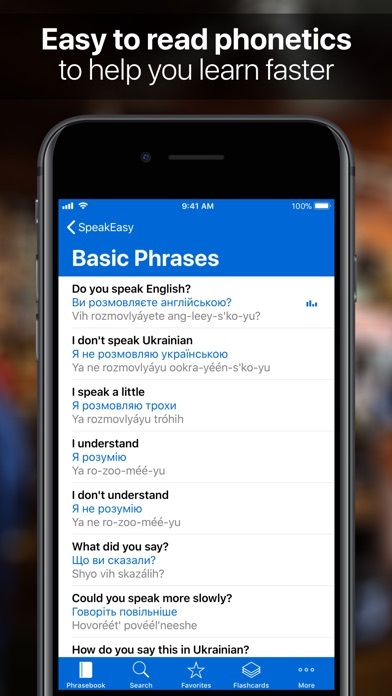 Each phrase includes a translation to Ukrainian, an easy-to-read phonetic translation, and an audio recording of a native Ukrainian speaker - all contained in a well structured, user-friendly interface. 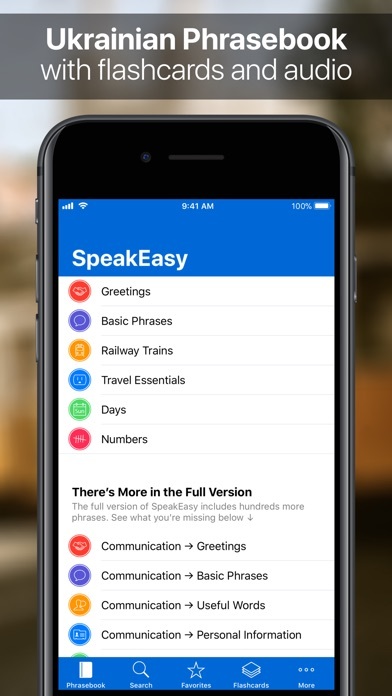 Whether you choose to browse phrases by category, or use the search facility to instantly find what you're looking for, SpeakEasy Ukrainian is an efficient lifeline when you know what to say but don't know how. FEATURES • 120 essential travel phrases with both Ukrainian and phonetic translations plus audio. 610 phrases are available in the Full Version. • Audio clips recorded by a native speaker to help you perfect your pronunciation. 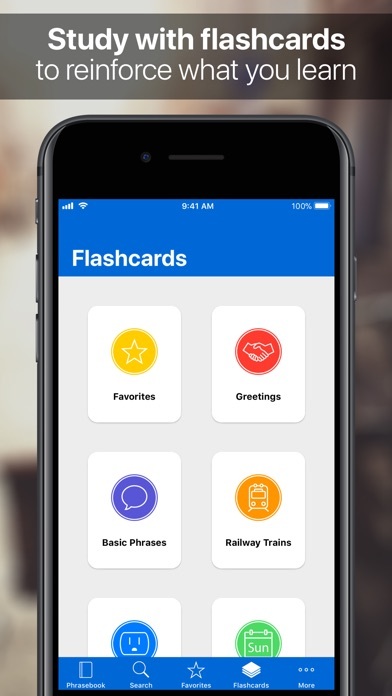 • Flashcards with English on one side and Ukrainian on the other side, that you can use to study and test yourself. • Slow-play feature that plays audio at a slow speed to assist learning. • Search facility to instantly find the phrase you're looking for. • Favorites feature to provide fast access to your favorite phrases. • Adjustable text size. You can use a larger text size for added clarity. • Hide the phonetics. If you're a pro and don't need the extra assistance, the phonetics can be hidden. • Copy the translations to the clipboard and paste them into any app you wish. • Support for US English, UK English and Canadian English spelling. • No internet connection required. The app will work no matter where you are. INCLUDES PHRASES SUCH AS: • Where are the restrooms? • What is your name? • How are you? • My name is … • Do you speak English? • Do you speak Ukrainian? • I speak a little • I don't speak Ukrainian • I speak English • Could you speak more slowly? • How do you say this in Ukrainian? • I need a translator • When is the next train to … ? • Where is an internet cafe? I grew up learning Ukrainian over the years and over time I have forgotten it. I looked through the app to see if it was accurate, and some of it is. But, Ukrainian can very region to region and can be mistaken very easily. Continue with caution, and that some of the phrases aren't as updated and fluently used as the app makes them appear. My mom grew up speaking Ukrainian. I thought I would take this app and learn Ukrainian so I can speak Ukrainian with my mom. I showed the app to my mom and she listened to that app speak Ukrainian. She listened and she said they are not speaking Ukrainian. Do not get this app, I know it is free but it's not worth your time to try to speak a language that is not really Ukrainian. Most useful app I have had while living in Ukraine. Plenty of phrases, very happy with the pronunciation and proper spelling in Ukrainian text as well as English phonetics! This is an excellent app to quickly learn phrases in Ukrainian! Very nice design and everything very seamless. I will be buying the rest of this app! This is a good app if you're planning a vacation to Ukraine, or if you just want to learn this beautiful language. Very melodious speech! I love this app! Ukrainian is such a beautiful language. And this has truly helped me with learning! And I am going to buy the app soon because this is the only thing I will use to help me learn Ukrainian. And I really wish you guys had a Greek one as well. Cause the would just be magnificent! I really like this program, it got me started quickly. I especially find helpful the ability to slow down the speaker by holding my finger on the phrase. Helps you if you have slow ears like me! Very good app. Just need more to learn of the language.